I’m Frado, the big friendly cat! 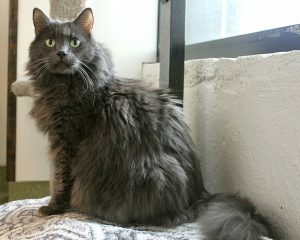 I am a very handsome and fluffy 8-year-old boy and I am everyone’s best friend! I have been nicknamed “Uncle Frado” because I am living in the cattery with some kittens who are super rambunctious and a couple others who are a little shy, and they all like to follow me around, snuggle me, and cuddle with me since I’m so sweet and soft. I am extremely tolerant of the little ones, including human kiddos! My overall personality is very calm and loving, but I definitely have my playful side. I get super excited watching the leaves fall outside my window — I’ll even jump up from a nap to chase them as they blow around the sidewalk. I’m very healthy, aside from being a little bit overweight. Being big and fluffy adds to my charm, I think, but the doctor did say I could stand to lose a pound or two. All I need is a family to get me moving and grooving and I think the pounds will come off quick. 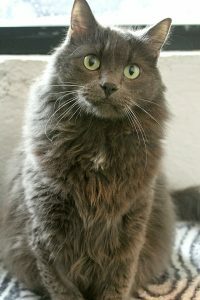 I’m very comfortable around everyone I meet, and I bet I’d be a perfect fit in almost any home. I have been indoors my whole life, so would probably prefer to stay inside. I’m the perfect bed-warmer, don’t you think? Stop by and say hello! I come to you fixed, vaccinated, and micro-chipped for an adoption fee of $100.